Cactus rot is a super common problem, and one of the main causes of cactus death. But just because your cactus is rotting doesn’t mean you can’t save it. 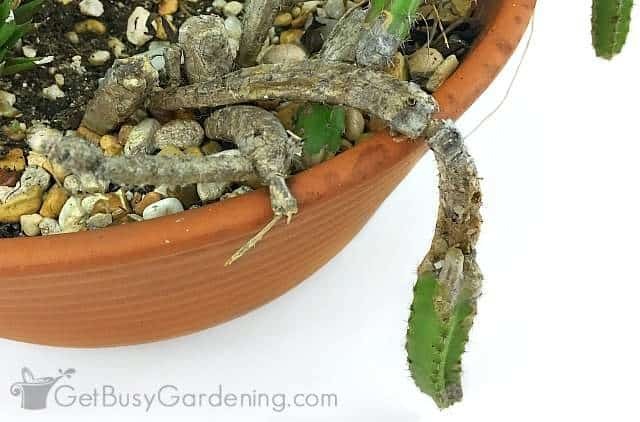 In this post, I talk about the causes and symptoms, answer all of your questions, and give you step-by-step instructions for how to save a cactus from rot. Rot can start anywhere on a cactus plant. It could start from the bottom and spread up the plant. It could start at the top and spread down. Or it could start anywhere in between. Why Is My Cactus Turning Brown At The Top? Why Is My Cactus Rotting Top Down? Why is my cactus turning black on top? How do you save a dying cactus? Why did my cactus rot? How do you bring a cactus back to life? What causes a cactus to die? When a cactus starts to turn brown and mushy at the top, it likely has something called tip rot (aka cactus stem rot). Basically that means that your cactus is rotting. Cactus stem rot will spread quickly if nothing is done about it. Once a cactus starts rotting top down, it won’t stop. It will continue to spread all way down the entire stem, and will eventually kill the plant. So, once you discover cactus tip rot, it’s important to act fast in order to save the plant. There are a few things that can cause a cactus to rot from the top down. Cactus rot is caused by either fungus, disease or water getting into an open wound on the plant. If a cactus is damaged in any way, it is vulnerable to being infected with disease or fungus spores. It’s also very common for water to settle into the wound, causing the plant to rot from the inside out. The damage could have been caused by anything, including houseplant pests, bugs or animals feeding on the plant. Someone could have brushed up against it, the plant could have tipped over, or maybe something fell on it. You may never know the exact cause, so don’t beat yourself up about it. The good news is that the steps for saving a rotting cactus are the same no matter how the it started in the first place. 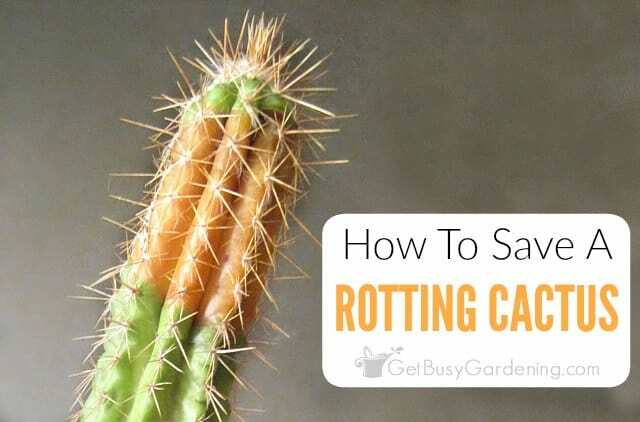 Below I will show you how to stop cactus rot from spreading so you can save your cactus. Once a cactus starts rotting, all the rot must be pruned off in order to save the plant. If it’s not completely removed, it will continue to spread, eventually killing your cactus. And cactus rot spreads very quickly. You don’t want to end up with a dead cactus plant, so you’ll definitely want to act fast. The steps for saving your cactus depend on where it’s rotting. So first I will show you the steps for how to save a cactus that is rotting top down. 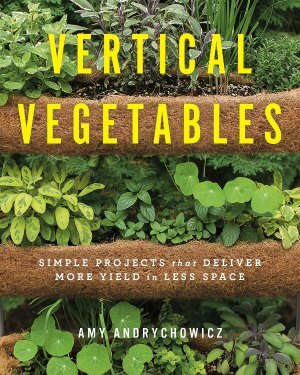 Then, in the section below that, I’ll talk about how to save a cactus that’s rotting from the bottom up. Cactus tip rot can be very deceiving. You may notice small brown spots on a cactus and think that it’s just a tiny bit of rot. Then once you start removing the bad spots, you realize that it’s much, much worse on the inside than it looked on the outside. Step 1: Choose your pruning tool – You can use a sharp knife or pruning shears to remove the rot. If your cactus is really thick, then I recommend using a sharp knife. Otherwise, for small plants with thin stems, precision pruners or bonsai shears would work great. Just make sure they’re super sharp so the cactus stem won’t be crushed. Step 2: Clean your cutting tool (do NOT skip this step!) – Whatever tool you choose to use, it’s extremely important that it’s clean and sterile before you make any cuts. Using a clean pruning tool will help prevent the spread of disease and fungus spores. You can simply wash your pruning shears or knife with soap and water, and then dry it before starting. I also recommend washing and drying it again between each cut. You could also dip it in rubbing alcohol to sterilize it. 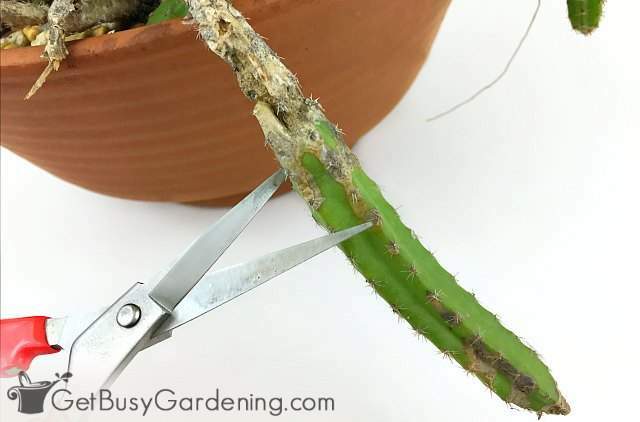 Step 4: Continue removing layers until all signs of rot are gone – As you work your way down pruning off layers of the plant, the rot will get thinner and thinner. But remember, even a tiny bit of rot can continue to spread. So be sure you remove all signs of brown, soft and mushy cactus material until there are no more signs of rot left on the plant. If your cactus is an outdoor plant, try to make the last cut at an angle so that water won’t settle on top of the wound (which will likely just cause it to rot again). I would also move the plant to a dry area where it’s protected from rain until the wound has callused over, if possible. Unfortunately, the rot on my plant was really severe before I noticed that the top was turning brown. I had to cut off over half of the cactus to remove all of it. As difficult as it was for me to remove a large section of this cactus, I know my plant would be dead in a matter of weeks if I left behind any rot. If you have to perform this type of surgery on one of your beloved plants, keep an eye on it afterward to make sure it doesn’t continue to rot. If it starts rotting again, follow the same steps above to remove the new rot. After a couple of days, the wound should callus over, and your cactus will eventually send out new growth near the cut. I was super sad to have to cut my cactus in half to remove all the rot. But heck, in the end I think it added more character to the plant. Unfortunately, if your cactus is rotting bottom up, or the cactus roots are rotted, then there’s not much you can do to save it. The best thing to do in this case is to cut off the healthy stem pieces, and propagate the cuttings. 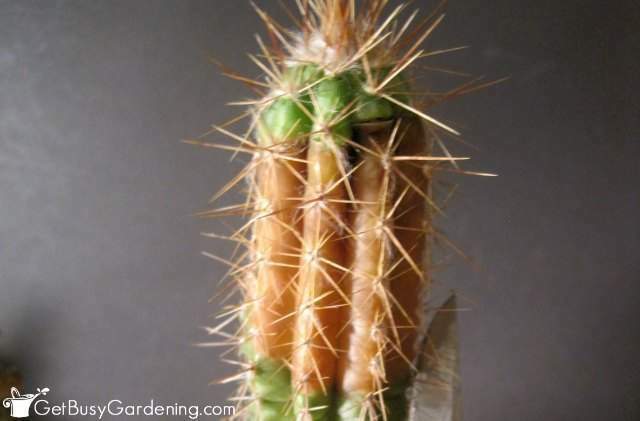 Prune your cactus back in layers as shown in the steps above so you’re sure to get all of the rot off the cuttings. Allow the cutting to dry for several days until the cut end has callused over. Then dip the stem in rooting hormone and stick it into a sandy cactus soil mix. Don’t water the soil until you see new growth on the cutting. 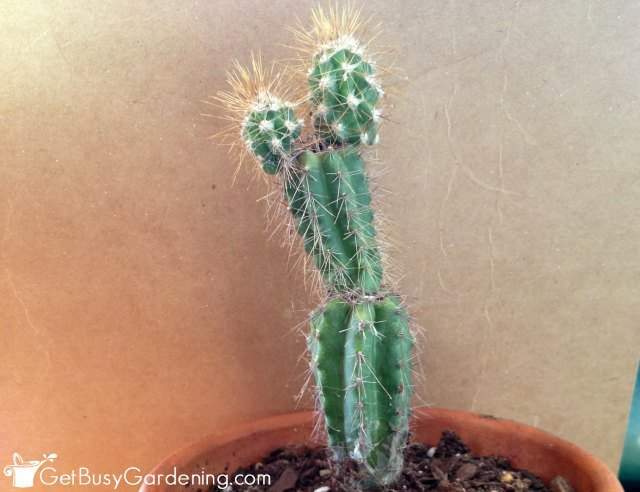 Depending on the variety you have, it can take several weeks for cactus cuttings to root. Here are answers to some of the most frequently asked questions about troubleshooting common cactus problems. If you can’t find your answer here, go ahead and ask in the comments section below. Because of cactus tip rot. Cactus rot can look black or brown in color. When a cactus starts turning yellow, it’s a sign that it’s probably starting to rot. If only parts of your cactus plant are yellowing, then you can follow the steps above to save it. However, if the entire thing is yellow, and your cactus is soft and mushy, then you may not be able to save it. It’s really hard to say how to save a dying cactus without more information. It depends on how it’s dying. Most of the time a cactus will start dying either from tip rot or from bottom rot. 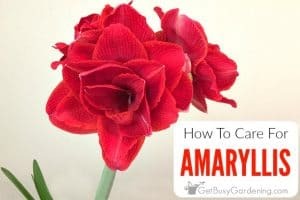 So check the plant carefully to see if you can find any parts that are changing color, or if the cactus feels soft. A soft cactus or a squishy cactus are both signs of rot. 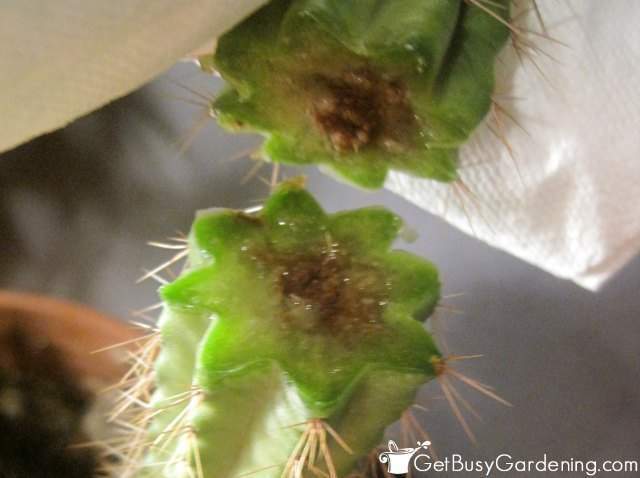 As I mentioned above, the main causes of cactus tip rot are either that a fungus or a disease has infected a wound on the plant, or water settled into it. For a cactus bottom rot, it’s usually caused by overwatering. An overwatered cactus doesn’t always start rotting right away, so it might not be obvious that was the cause. Well… that depends on how dead it is. But if the cactus is completely mush and there’s no green left on it at all, then I’m afraid you’re probably not going to be able to bring it back to life. 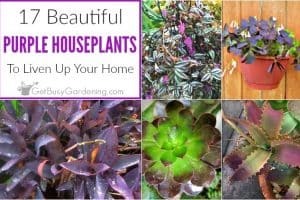 If, however, there is still a decent amount of healthy growth on the plant, then you might be able to save it by following the steps above. Overwatering is the number one cause of cactus death, especially for potted plants. A consistently overwatered cactus plant will starting rotting at the roots, and eventually work it’s way from the bottom of the cactus up. Signs of overwatering cactus plants are difficult to spot though. 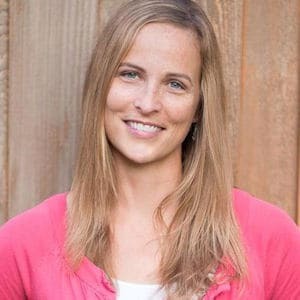 Many times once the obvious signs show up (cactus turning yellow, black or brown, or a soft and mushy cactus plant), it’s too late to save the plant. If you’re unsure of how much to water your cactus plant, I recommend getting an inexpensive soil water moisture gauge to help you get it right every time. 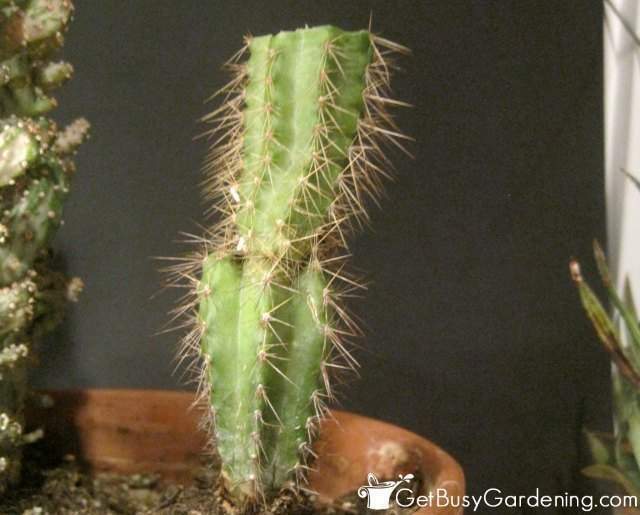 Cactus rot can be super frustrating, but it’s not always a death sentence for your plant. Unfortunately, it’s a pretty common problem with cactus plants. So it’s a good idea to check your plants regularly for signs of rot. And remember, if you ever notice your cactus rotting make sure you act fast in order to save it! 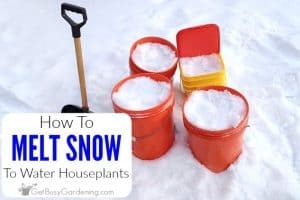 If you struggle to keep your houseplants alive during the long winter months, then my Winter Houseplant Care eBook is for you! 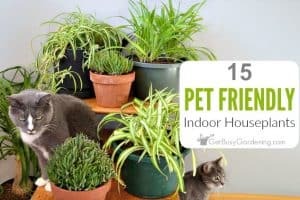 It has everything to need to in order grow healthy houseplants that will thrive all year round! Download your copy today! 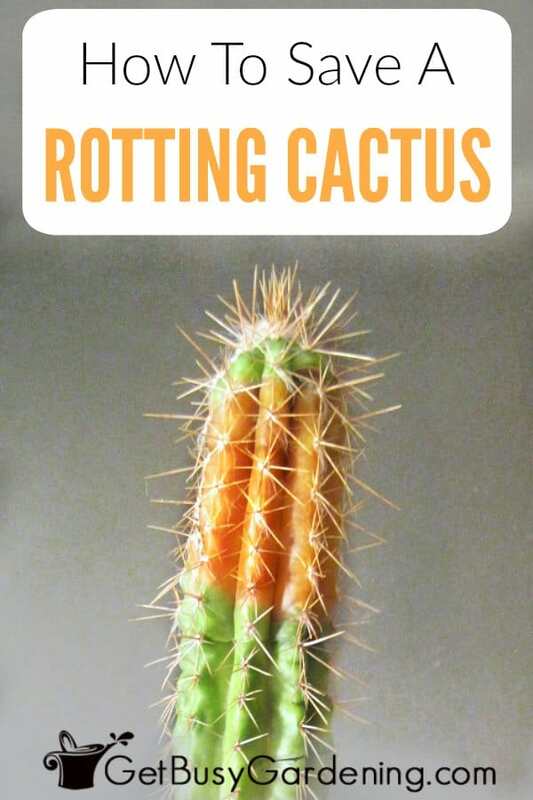 Share your tips for saving a rotting cactus in the comments section below. Oh I've had this happen before but had no idea the plant could be saved. Good to know it can be! @bakingbarb – Glad I could help! Hopefully you won't have to worry about any problems with cactus rot again, I hate when it happens! I just checked my plant today and it looks like it's callused over nicely. Yeah! Glad you know what to do. I don't know much about Cacti, so mine probably would have died. Hope the trimming keeps it going. @PlantPostings – thanks. The first time this happened, I off the rot thinking it was going to die anyway so I might as well try to save it. There wasn't a lot of info online about tip rot then. So, I guess it was trial and error, and it worked! I hope it works again this time too. Ack, that looks nasty. Cacti look so hardy, but the more I learn, the more they seem like really delicate plants unless you live in exactly the right climate. @nk – that is so true. I hear people say all the time that you can't kill a cactus plant. Ha ha! They’re actually pretty easy to kill… too much water/moisture is the sure way to do it. My cactus has some hard grey tips that have a grey powdery coating. I assume these have to come off so do I just follow these directions? Is there something I should feed it or externally treat it with? Hummm… I’m not sure what the hard grey tips could be. When you say they have a powdery coating, it makes me think about mealybugs. Take a close look and make sure your cactus doesn’t have any bugs. I noticed the top of my cactus turning black today! Is this tip rot? Can I post a picture? I have had it for probably 10 plus years and would hate to lose the plant! Help! Yep, it sounds like it could be cactus tip rot to me. You can post a photo on my Facebook page if you want, and I can take a look. The forked cactus after the cutting is so cute! Always a silver lining. I kept my cactus outdoors last winter and seems it was overwatered by rain. In spring it became very pale (between white and yellow) and the tops were rotting. Even the new growing daughters around it were pale as well. I immediately removed it from its soil and put it in new dry soil and didn’t water it for nearly three weeks, removing the rotten tops. And now it is alive again, returned green and had grown new parts. Wonderful. Awesome!! So glad to hear you were able to save your rotting cactus and it’s babies! I stopped putting my cactus plants outdoors because I couldn’t control how much rain they were getting, and had a lot of problems with rot.